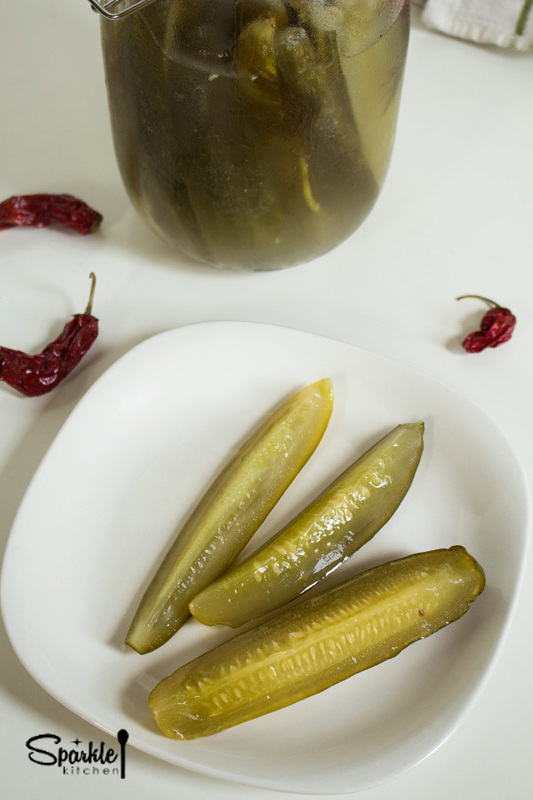 Crunch into a tart, juicy pickle. Pickling vegetables throughout the summer is one of the best ways to capture the season’s produce. But perhaps that approach is all wrong. Vinegar is most commonly used to achieve a sour flavor and act as a preservative. This method misses out on the entire reason the world began pickling foods. The goal is to produce fermented vegetables that turn them into healthy probiotic food. When a brine of salt and water is used rather than vinegar, the salt reacts with the bacteria in the vegetables creating good bacteria that helps our digestive systems. 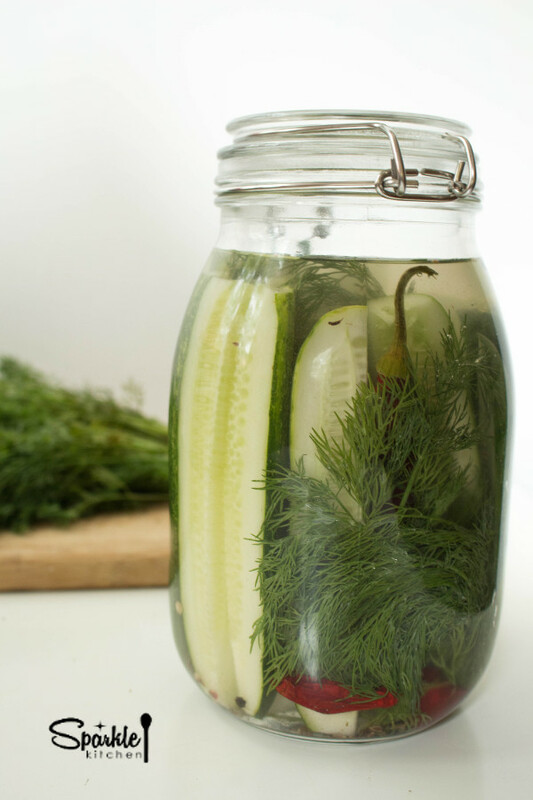 The majority of store-bought brands are vinegar pickles, but a few companies are making small-batch fermented vegetables, like Real Pickles and The Brinery. Now for a little biology lesson. More than 100 trillion individual bacteria and yeasts live in the gut. Their purpose is to help digest the food we eat and in turn the food we eat feeds them. Eating probiotics gives the bacteria what it requires to maintain optimal functioning of our cells. Think of your body as it’s own ecosystem. That system can easily be thrown out of balance if the wrong bacteria takes over. Eating high starch and high sugar foods leads to our bodies producing more sugar-loving bacteria and yeasts because we are literately feeding these microorganisms. Sugar-loving bacteria throws off the body’s ecosystem causing poor digestion and all the problems this brings. By incorporating probiotic foods into your diet, you are feeding the bacteria that keeps your ecosystem in balance. 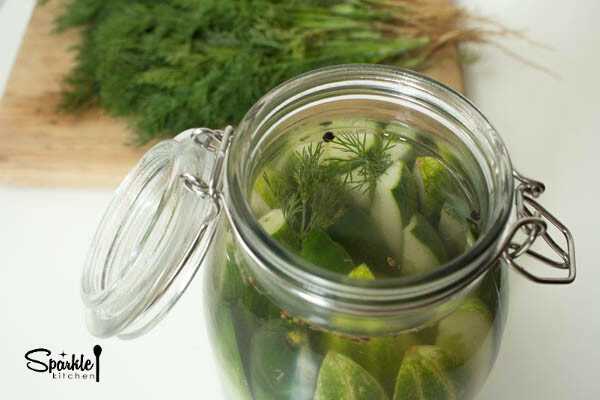 In order for fermentation to occur, vegetables sit in a brine at room temperature for about 3 days to 2 weeks. The bacteria required for fermentation are found right on the cucumbers. All plants have naturally occurring bacteria existing on them. When placed in the brine, the bacteria react producing carbon dioxide and lactic acid. Eventually, the conditions within the jar become too acidic for these bacteria to survive and they die out, replaced with bacteria that can better handle the acidic conditions such as Lactobacillus (lactic acid bacteria). It is this bacteria that aids in gut health. Fermented foods are super simple to make and it’s easy to customize the flavors to your liking. For pickles, choose cucumbers that are a good size for your jar. Pickling or “Kirby” cucumbers work well. Persian cucumbers can go limp and do not stay as crisp as the others. The water must be filtered for the fermentation to take action. Chlorine is added to most municipal water supplies and counters the chemical reaction. If you don’t have a water filter at home, pick-up some filtered water from the store. As for the container, pickle crocks, wide-mouth glass canning jars or glass jars with clamp lids can be used. Once all the supplies are gathered, you’re ready to pickle! Using filtered water, scrub the cucumbers and remove the stems. Then slice into spears. Dissolve the salt into the water and set aside. 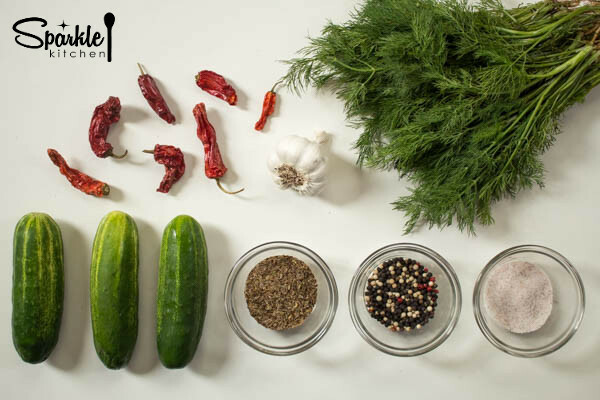 Add in all spices and herbs to the jar, then pack in the cucumbers one spear at a time so that they’re neatly stacked. Now something is needed to weigh down the cucumbers to keep them submerged in the brine. I like to use a large cucumber by slicing it in half and packing it on top of the jar. Pour in the brine until one inch is left at the top. Leaving a one inch space at the top of the jar is necessary for air bubbles to escape during the process. The chemical reaction causes pressure to build up inside the jar. If using a jar with a clamp lid, remove the plastic seal. For screw tops, twist in on half way. Then make sure to check on the jar every day and open it to relieve the pressure. Sometimes fermentation can be temperamental. It will take between three to nine days to fully develop and its important to keep the jar in a stable environment. Store it in a dark place and as close to 75 degrees as possible. Temperature affects the growth and activity of the fermentation process and if kept too high the wrong consistency will result. It’s also possible for the lactobacillus to become too acidic early on in the process and then the food will spoil. In about five days, you’ll have crisp, sour pickles. Store in the refrigerator for up to two months. 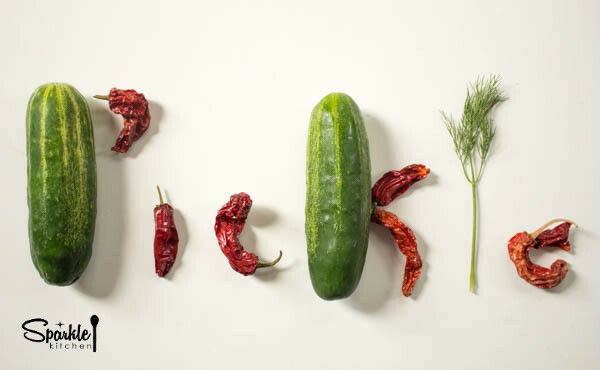 With this basic recipe, you can pickle almost anything. Try it with any vegetable or combination of vegetables and get creative with fresh herbs and spices. To power your digestive tract, ferment those vegetables. 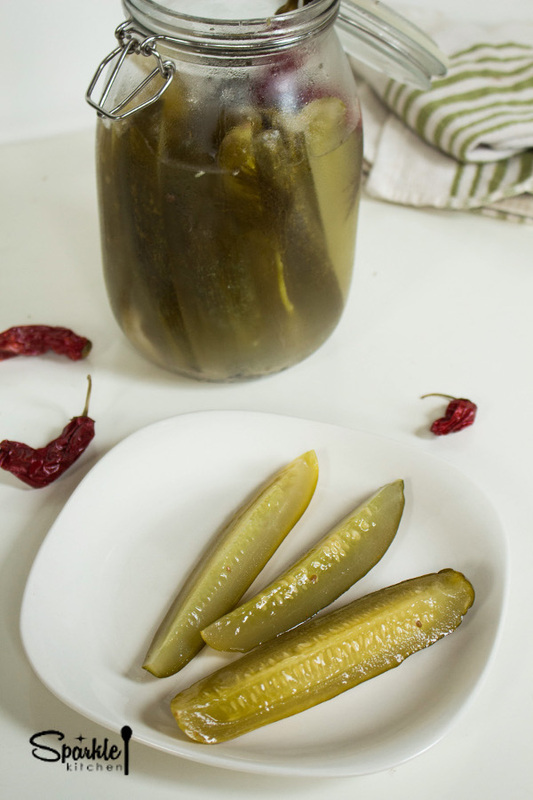 Pickles made by fermentation for probiotic benefits. Combine water and salt, stirring to dissolve. 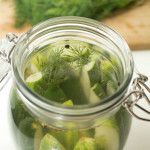 Place garlic, dill seed, peppercorns, fresh dill and chilies into the jar. Then neatly stack the cucumber spears vertically. Slice an extra cucumber in half and use it as a weight to keep the spears submerged in the water. Pour salt water over the cucumbers and spices, leaving 1 inch at the top. Cover with the lid but only seal part way. If using a jar with a clamp lid, remove the plastic seal. For screw tops, twist in on half way. Place in a dark place that is able to maintain a 75 degree temperature. Check on the jar every day and open it to relieve the pressure. Test the pickles after the third day to make sure the chemical reaction is working properly. After 5 to 7 days, the fermentation will be complete. Store in the refrigerator for up to two months.